GENERAL GROUNDHOG TRAPPING: Groundhog trapping is subject to state laws regarding capture and relocation or euthanization of wildlife. If you have unwanted groundhogs outside the home, in some cases, the only fix is to trap and remove the nuisance wildlife. We can safely, legally, and effectively catch and remove your nuisance groundhogs. Trapping is an art, and most amateur attempts go awry for a variety of reasons. 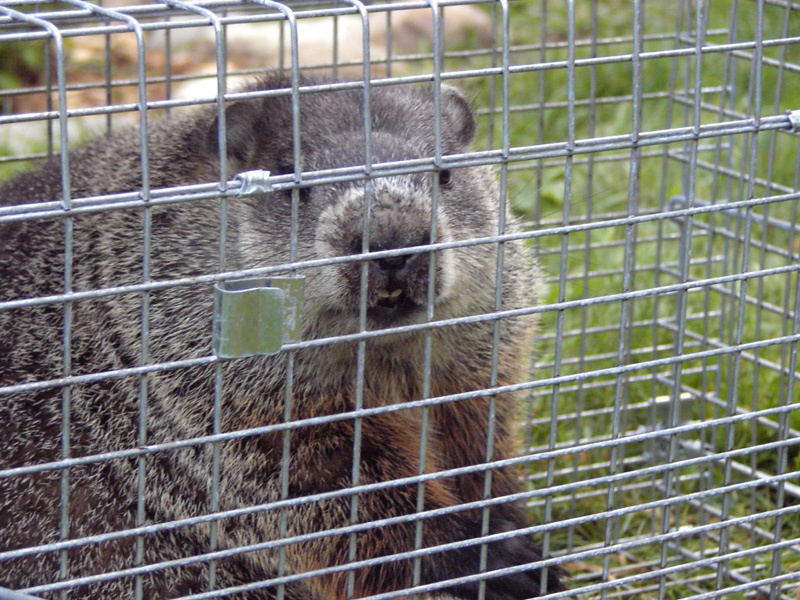 An intimate knowledge of groundhog behavior, and of various groundhog trap types is necessary to ensure that the groundhog is trapped and removed without incident. STEP 2: Select the right trap for the situation. STEP 4: Use the correct bait. Usually fresh vegetables are best. STEP 5: Monitor the trap daily, remove trapped groundhogs and transport them. What can we say about the groundhog? Well, it can grow up to eight pounds in weight. It can cause some serious construction problems with your home. It can also destroy even the most beautiful of flower and herb gardens, and that is before we even start with the holes in the lawn or the effect this creature will have on your household pets. This creature might look cute, but it can actually have the power to burrow under your home, causing damage to the framework and foundations, by removing up to 700 pounds of soil. You might think the animal is cute, but remember how much damage it can do when you are undecided on whether or not to call wildlife control! Coming back to the weight, this is a big factor when you want to choose a trap for the little blighter. Ideally, it is going to be big enough to contain the animal, while still being light enough for you to carry it, plus the groundhog, to its new destination. One point that you are going to need to bear in mind is that some states actually say that it is illegal to catch and release certain animals – it is well worth checking this out before you get yourself into a lot of trouble. Sometimes calling in the professionals really does work out cheaper than trying to figure it out on your own! The dietary preferences of this creature not only make it easy to spot, but it also makes it easy to choose bait. It loves herbs, fruits that you might grow in your garden, peas, and even beautiful flowers such as pansies. If you have noticed that these things have been nibbled in your yard, it is time to take action. One of the best foods that have been noted by professionals as bait for groundhog trapping is cantaloupe. This creature just loves it; the more rotting the better! Be free and easy with it – cut it into 2 inch square chunks and throw it all around the trap. Make sure you focus the largest amount in the trap though, otherwise it won’t work. Dribble the juices in trails leading to the trap and leave it! Don’t clear it up, even when it looks disgusting – believe it or not, they love it! 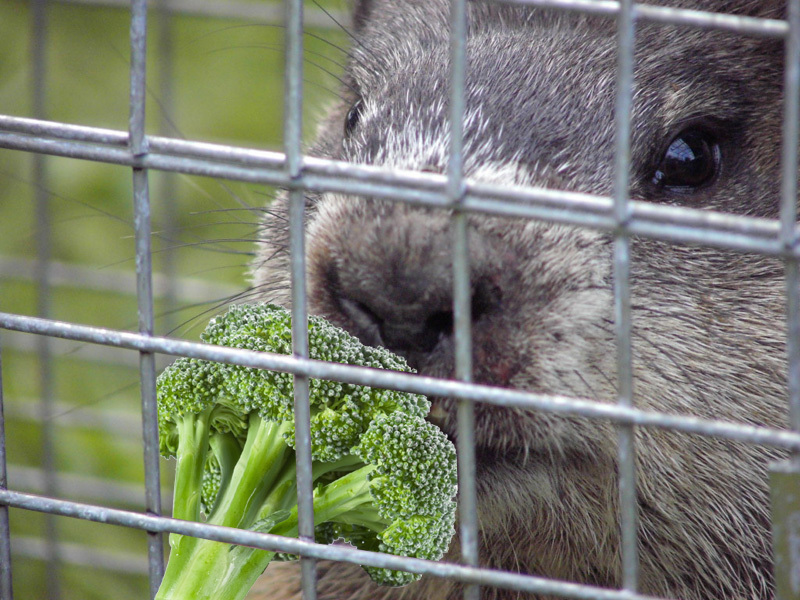 There are some preventative methods that you can take to keep the groundhog off your land once you have caught it. Big wire fencing is good, but you will have to make sure that it goes very deep in the ground – remember, these critters can burrow! Again, this is one of those things that a professional is handy for. You want to get this right first time – there is no point in spending hundreds and hundreds of dollars on fencing and having it installed around the perimeter of your home, only to find out that it hasn’t worked and the thing is back! Go back to the main Groundhog Removal page for more information about Groundhog trapping – how to catch groundhog with traps .